Select a diverse, local ecotype seed mix, and ensure good seed-to-soil contact for a successful prairie seeding. Then, mow it periodically to manage weeds during establishment. Preparation. 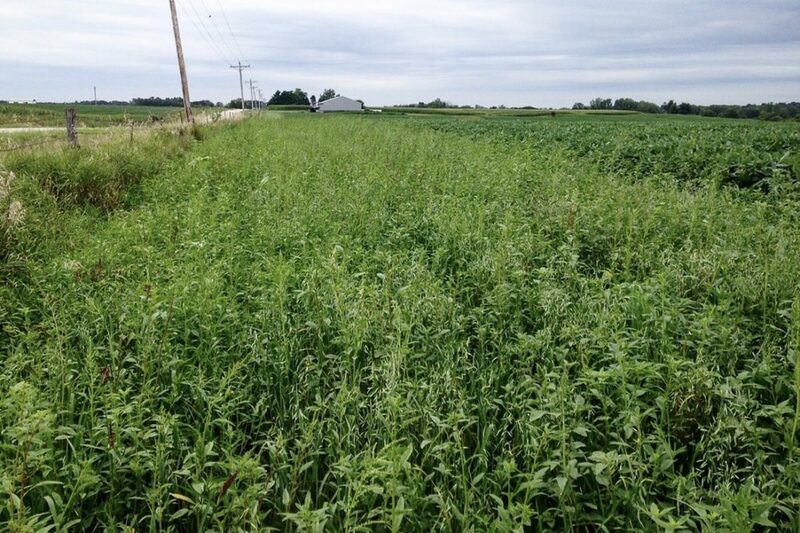 If perennial vegetation is present, terminate it with herbicide or tillage prior to seeding. In some cases, more than one application may be needed. 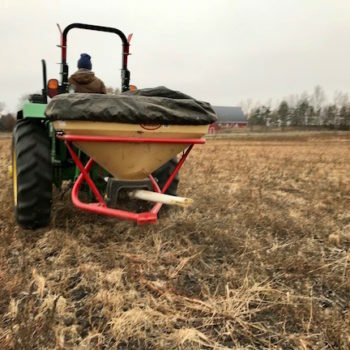 Ahead of seeding, ensure ground is even and free of ruts. Diversity is key. A high diversity local ecotype mix will be the most resistant to weeds, and will provide the best habitat for wildlife. Timing. 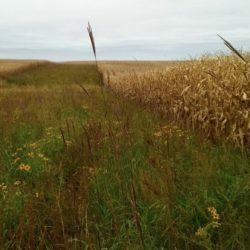 A great time to seed prairie is in the fall or winter, which may accelerate reconstruction and result in a higher population of wildflowers for pollinators. Method. Seed that is broadcast on the soil surface in fall or winter will gently work its way into the ground as it freezes and thaws. If broadcasting in the spring, follow seeder with a cultipacker to ensure good seed-to-soil contact. 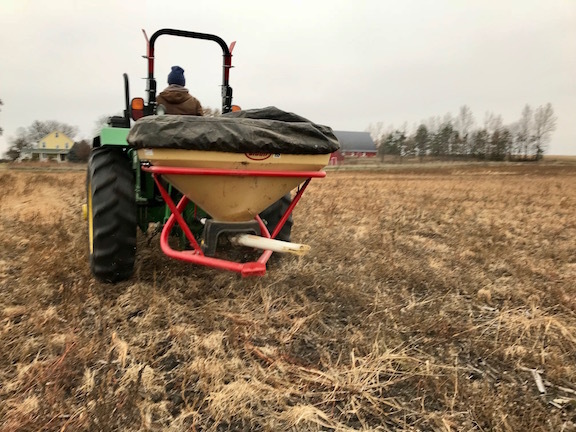 Broadcasting prairie seed with a Vicon® seeder. 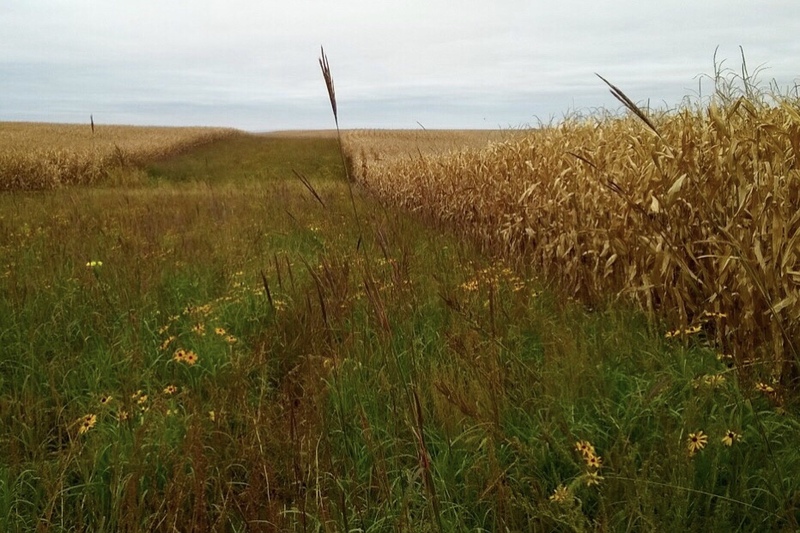 Prairie strips reduce nitrogen leaving crop fields by 70% in surface runoff and 72% in groundwater. Year 1: Mowing is essential to ensure prairie establishment. Plan to mow three or more times–about every month during the first summer. If possible, mow at a height (about 4-6″) that clips the seed heads of the annual weeds but allows sunlight to reach prairie undergrowth. Use a type of mower and mowing frequency that ensure that clippings will not clump up and smother prairie seedlings. Year 2: If high weed pressure, plan to mow once or twice to clip off the seed heads (at a height of 10-12″) when they grow above prairie plants. 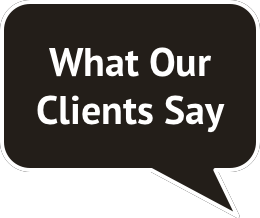 Year 3: Plan to mow once (if needed) to clip off the top of weeds if they grow above prairie plants, or to discourage encroaching woody vegetation. Conduct a prescribed burn, graze, or mow every few years or more. 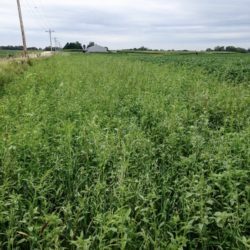 This reinvigorates native prairie plants and discourages annual weeds as well as woody and invasive species. Reviewed by the STRIPS science team at Iowa State University for science/economic content related to prairie strips on April 3rd, 2018. A large flush of weeds emerge in the first spring. Mowing enables prairie seedlings to access sunlight and nutrients. Photo courtesy of Tim Youngquist. With careful mowing, prairie species like big bluestem and black-eyed susan may become apparent by the fall of the first year. Photo courtesy of Tim Youngquist.